If your workers’ compensation doctor has ordered a spinal fusion surgery, you need to be careful about the risk of being rushed back to work before the fusion has become solid. Your workers’ compensation doctor may suggest spinal fusion if you have injured your neck or back at work, and the cushioning discs in your spine have deteriorated (degenerated). Fusion surgery may help relieve your pain and restore function. Fusions are serious surgeries and generally not recommended until other, non-surgical options such as physical therapy, epidural steroid injections or facet injections are tried without success. The purpose of a fusion is to stabilize your spine by removing the deteriorated disc material and fusing two vertebrae together. When successful, bone and disc material will no longer irritate your spinal cord and you should experience a reduction in pain. Often times, instrumentation in the form of screws, rods and plates may be used to stabilize your spine and to keep the fusion site immobile. Sometimes a second surgery will be required to remove or adjust the instrumentation. If the fusion fails, however, it may be difficult to find a doctor to attempt a second surgery. Often failed fusion patients end up in long term pain management, where you may find yourself taking opiod pain medications for the rest of your life. Thus, if you choose to undergo fusion, you should look for a highly skilled surgeon and diligently pursue all available post-surgery rehabilitation. Even where surgery is successful, tou may find that your back is less flexible at the site of the surgery and you will have to relearn physical tasks such as lifting, carrying, bending, stooping and even walking. You will also need to avoid certain physical activities such as heavy lifting or extreme bending or twisting that can stress the fusion site. If workers compensation was not involved in your case, your doctor might try non-surgical alternatives for 6 to 12 months before recommending surgery. Following surgery, your doctor might monitor you for 12 to 18 months, while using physical therapy and work hardening exercises to help you restore function. When workers’ compensation is involved, however, we often find that your employer’s insurance company will do what it can to encourage your doctor to speed up the post surgery recovery process. We have seen cases where injured workers are returned to work far too soon – either before the affected vertebrae actually fused (this is called a “non-union”), or before the injured worker completed necessary rehabilitation to regain strength and mobility. We also find that employers are often not especially cooperative when it comes to modifying job descriptions to account for an employee’s post surgical capabilities. 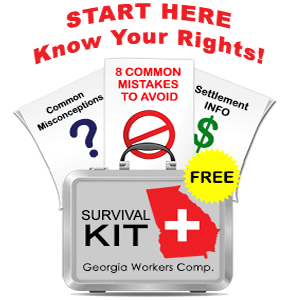 I have some very strong opinions about the capabilities of spinal surgeons in Georgia who accept workers’ compensation patients. If a workers’ compensation doctor recommends a spinal fusion, I will insist that my client seek a second opinion. If surgery ends up being the preferred option, I will use all legal options available to me to get a qualified surgeon approved. Sometimes the insurance company will agree to pay for the surgery and post-surgical rehabilitation, while in other cases, my client may choose to settle his/her case for a lump sum, then use those funds to pursue surgery with a qualified doctor. The strategy we use in each case will depend on the facts and circumstances of that particular case. While every work injury claimant wants to conclude his/her case with a large lump sum settlement, I think that my clients’ long term health concerns are more important than a one time lump sum payment. Since no surgeon can guarantee the results of any surgery, you need to proceed carefully, deliberately and with full knowledge whenever surgery is suggested. As your attorney, I will help you evaluate your options and make informed choices given the options available to you. If you are facing the possibility of a spinal fusion or any other type of surgery, and you would like to discuss your case, I welcome your call at 770-351-0801 or your email from the contact form on this page.